How cool are our cool nights! January 2016 is possibly going to pan out to be one of the warmest January’s on record in South Australia – just waiting for the meteorological team to make their call. Fortunately here in the Adelaide Hills, we have a secret weapon. It’s called ‘Cold Nights Throughout the Year’. Not only does it make my life more bearable in summer when heatwave-days melt away to positively chilly nights, but it is also one of the defining features of the terroir for our Adelaide Hills wine region. The grape growing region of the Adelaide Hills is defined as being ‘Cool Climate’ not because we have particularly cold days in our summer growing season, but because of these cold nights. What this night time chilling effect achieves is a considerable reduction in our mean 24 hour temperature recordings which are calculated as a mean of the summation of all the recording over a 24 hour period. Clearly, the more frequent the daily recordings, the more meaningful will be the mean. 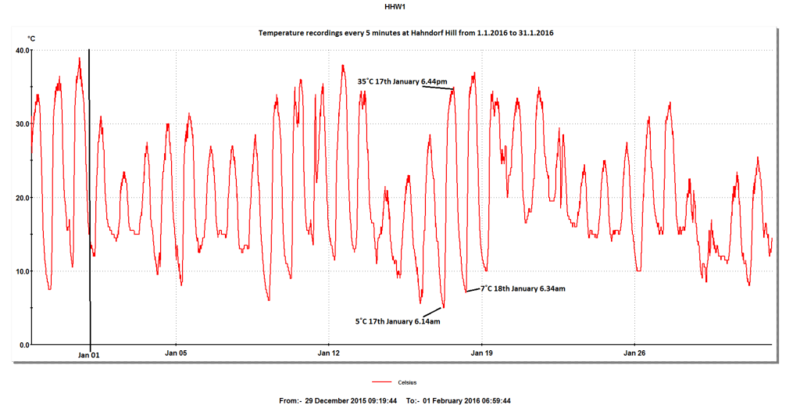 My trusty little digital temperature logger takes a recording every five minutes of the day for the full month of January, which permits me to calculate the Mean January Temperature (MJT) at our site in Hahndorf. On the morning of the 1st of February I dash down to my weather station to collect the logger and plug it into my desktop and trawl though the January temperature data. There are 8928 individual recordings for the month of January plus a handy chart that graphically logs the temperature changes for the period. Note that there were 14 days in January 2016 that had maximums exceeding 30˚C which is indicative of how warm January was this year. There were also 10 mornings that dropped to temperatures below 10˚C, with the lowest being 5˚C on the morning of 17th January at 6.14 am. The difference between the day’s maximum recorded temperature and the day’s minimum recorded temperature is called the diurnal variation – the drop between the highest recorded day temperature and the lowest recorded morning temperature. The diurnal variation between the maximum of 35˚C recorded at 16.44 on the evening of 17th January, and the minimum of 7˚C recorded on the morning of 18th January at 06.34 is a whopping 28 degrees. This phenomenon of significant diurnal variations in summer is something that the Adelaide Hills has in abundance. And the outcome of all these calculations? Well, our MJT for 2016 was 19.8˚C which is distinctly warmer than previous years, but still falls into the broad definition of Cool Climate grape growing, courtesy of the cold nights. Perfect for Gruner! This entry was posted in Adelaide Hills, Adelaide Hills Gruner Veltliner, Adelaide Hills wine, Adelaide Hills wine region, Blaufrankisch, cool climate wine, Diurnal variation temperature, Gruner Veltliner, Gruner Veltliner Australia, Hahndorf, St Laurent, Uncategorized, wine, Zweigelt and tagged Adelaide Hills, Adelaide Hills wine, Adelaide Hills winery, Blaufrankisch, cool climate wines, Diurnal variation temperature grapes, Gru, Gruner Veltliner, Hahndorf Hill Gruner Veltliner, harvest, New Planting, St Laurent, Zweigelt, Zweigelt Australia. Bookmark the permalink.